I love the intersection of science and spirituality. Logic and creativity. Albert Einstein, Carl Sagan, Nikola Tesla, Stephen Hawking, and more I assume, allowed their spirituality to infuse their work in physics. The belief in a power larger than humanity, the practice of meditation, the experience of wonder/awe, and/or the practice of curiosity allow our minds to expand to comprehend and accept new facts and truths. Creativity and innovation begin with curiosity and a desire to become aware of what we don’t already know. Whether you work in science, business, education, etc, curiosity, not certainty, breaks down barriers and previous limits that can then be overcome. The spirit of curiosity holds hope and exploration and openness. 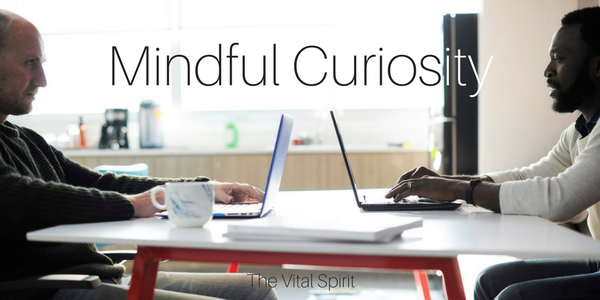 What situation or area of life can you apply a little curiosity in hopes of finding new answers, solutions, or ways forward?